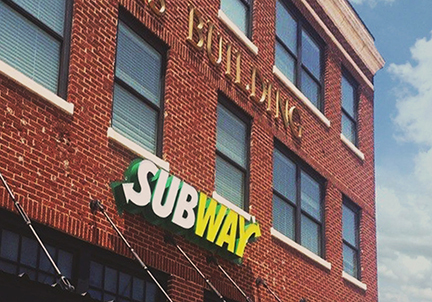 The new subway sign on the Texas Building on the Denton Town Square. It's a tangible modification when the neon trademarked sign of a sandwich franchise gets bolted to a beautiful building downtown. Our city is changing and is changing right now like an awkward seventh grader at Calhoun Middle School trying to figure out how to avoid getting pummeled on the field during gym class. Your first instinct is to go tell "Coach" who might just put the hammer down and temporarily stop the mild battery. Except that now, as a seventh grader, you've seen things and kinda know how the world operates. You're aware of how things aren't always fair. Coach won't always be there to chew out your arch nemesis and what's gonna happen next year when you're in a whole new gym class? It's a decisive moment when you finally decide that it's time to plant your feet the next time that kid tries to mow you down. So what if you get clobbered and a little bloody? The next time you plant your feet as he barrels down on you it's easier. The next time it happens, standing your ground has become second nature. So now as we watch our beautiful and charming town grow up it's going to be better to realize sooner than later that there will be more Subway signs, 6am trash collection, graffiti on the courthouse, cars jumping curbs and going down one way streets and the general level of injustice (perceived and real) will rise if the citizens who care so deeply about these things don't engage and take part in the discourse that makes this town great in the first place. What better way to start that conversation than to get out and support local businesses and craftspeople? There is an enormous amount of opportunity to do this each week and we're here to give you that nudge by presenting what we believe are just the top ten things you need to check out this week. So get out there, join in on the discussion and remember there's more value in the occasional bloody nose than Subway's breakfast meal deal. Got a hot tip you think should make The Den10? Send it in to info@wedentondoit.com. Wine Squared is turning eight years old, and Brooke wants to share their favorite wines and tell you how she feels about them from the past year. Wine is cool, and so are small businesses that make it this long in Denton. Happy Birthday, y'all! Do you love Sufjan, TOTR and trombone? Well have we got a show for you. Folks who are interested in the environment and sustainability can meet up and talk about it this Thursday. I'm going to make a solid bet that you hear "I'm just trying to sustain this buzz, am I right y'all?!" by 6pm. This is the event that eventually led to the creation of what we now know as The DIME Store. Besides being able to shop from 40+ handmade and vintage makers and food trucks, the first 50 folks get a free goody bag full of handmade and local merch including the first ever We Denton Do It stickers. This is quite the lineup for the price. It's been said by Dirtyhippieradio.com that Sons Of Illustrious Father "are extremely good at what they do." Can't argue with a dirty hippie, can you?